Massage is the practice of applying structured or unstructured pressure, tension, motion, or vibration — manually or with mechanical aids — to the soft tissues of the body, including muscles, connective tissue, tendons, ligaments, joints, lymphatic vessels, and organs of the gastrointestinal system to achieve a beneficial response. Massage Therapy is performed primarily by a professional Massage Therapist but is often used as a form of therapy by other Healthcare practitioners such as Chiropractors, Osteopaths and Physical Therapists. The types of massage I offer aid the processes of injury healing, relief of psychological stress, for pain management pain, and for the improvement of circulation. Explanation of the types of massage I am qualified to offer are listed in the Profile and Credentials section below. In my practice I want you to be comfortable, therefore I have several treatment options available that involve lying on a massage table, sitting upright in a massage chair, or lying on a pad on the floor. Good communication is essential to effective massage. Before we begin we will discuss the type of treatment expected: intention of the massage, areas to be massaged and to be avoided in full body massage, the amount of pressure that is comfortable, preferred techniques and how they will affect your body and overall wellbeing. Your first visit will include discussion of your medical history and current physical condition. 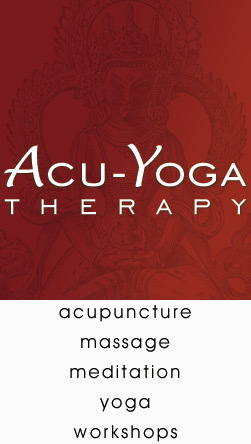 Acu-Yoga Therapy is a holistic approach to wellness combining the eastern healing practices of acupuncture, massage, meditation and yoga. We uncover the root of disease and prescribe a comprehensive treatment including herbs, diet and lifestyle changes. Our approach treats the physical, mental, emotional and spiritual bodies for maximum healing efficiency. Want to get in shape in 2010? A Total value of $235! The Alternative To Big Impersonal Gyms! Get your 7 Day FREE Pass here. We go above and beyond to make our members feel comfortable and to help them get the results that they want. Our club welcomes people of all fitness levels in a friendly, welcoming environment. 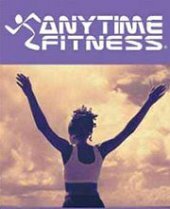 If giant warehouse gyms make you cringe come by and experience Asheville's unintimidating alternative - Anytime Fitness. Group exercise classes in our brand new studio! Asheville North Carolina Massage & Day Spa Services and also, Mobile Onsite services, Upscale Massage therapy & Luxury Health Beauty Day Spa treatments, Spa Packages, Spa Parties in the comfort of your Home, Office, Hotel, Cabin or Vacation Rental Accommodation. Serving Asheville, North Carolina and all Western North Carolina areas. Fairview-Lake Lure-Black Mountain-Hendersonville-Waynesville-Cherokee. We specialize in couples packages, romance-romantic getaways. Over 10 yrs, 30 years in business. I practice both The Trager Approach and Reiki. 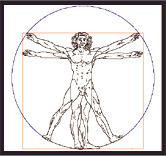 Gentle, yet deeply effective, The Trager Approach, also known as Psychophysical Integration, uses movement to relax the body/mind, ease pain, release habitual patterns, reduce stress, improve athletic perfomance, ease chronic illness. Though the sensations are gentle, the work is profoundly deep. Both Trager and Reiki are gentle, nurturing and very safe making them appropriate for use by geriatric, pregnant or self-conscious clients, as well those recovering from addiction and abuse. Our vision is to empower you with the ability and information you need to live a relaxed and healthy life. The way in which we accomplish this is by providing you with holistic health care in a spa setting to further enhance your experience. We offer gentle chiropractic care, Hatha yoga, Pilates, massage & bodywork, spa therapies, steam treatments, nuritional counceling, workshops, and a 100 Hour Pilates teacher training certification. We also have a bookstore and gift shop featuring an assortment of books, candles, yoga props, and spa products to support you in caring for health. Increase energy, flexibility, and stamina. Reduce pain, stiffness, and stress. Discover two silent secrets to the wealth of great health. 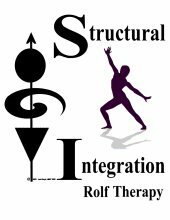 Enjoy blissful bodywork and compassionate structural integration, the original Rolf therapeutic method. It’s how this practitioner applies this method that makes all of the difference! Amazing results! Long-lasting. Time & Cost-Effective. Also experience free structured water to leverage your healthcare through acid-alkaline balancing to achieve homeostasis. Located in North Asheville at beautiful, historic, Clover Cottage are Licensed Massage and Bodywork Therapists, Anna Isabela Reality LMBT #3866 and husband David L.Humphreys LMBT #3865. Anna and David describe their massage techniques as Swedish/Deep Tissue. 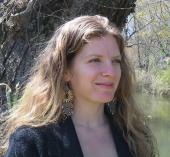 Anna also is certified in Reflexology and is trained in Craniosacral Therapy, and Healing Touch. The treatment rooms at Clover Cottage are in the turret, and provide a wonderful atmosphere for relaxation. Specialties include Couples Massage and massage for Fibromyalgia, Pregnancy, and TMJ. David is also a professional photographer. 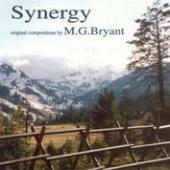 Musical Compositions featuring grand piano and strings with orchestration. Relaxing, rejuvenating, stress release and contemporary. 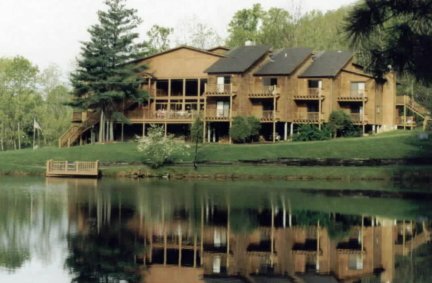 RETREAT & CONFERENCE CENTER, MASSAGE THERAPY TRAINING SCHOOL Located in heart of the spectacular Blue Ridge Mountains just 8 miles north of Asheville, our Resort is on a picturesque 24-acre estate exquisite with natural beauty. This peaceful oasis has a large central Lodge that provides meeting facilities, beautiful accommodations, gourmet cuisine, spa services, healing retreats and many leisure activities. The NC Board approved and internationally recognized School of Massage offers six concurrent six-month Massage Therapy Certification Programs (600 HR) annually, and a wellspring of Continuing Education and CEU classes. Our school provides every training facet needed to become a nationally certified bodywork professional with a fulfilling career. 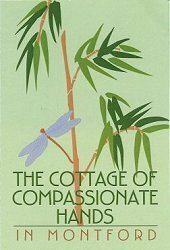 The Cottage of Compassionate Hands in Montford is a special wellness center and spa devoted to health and healing. Gloria Coppola provides continuing Education Workshops approved for CE Contact Hours through the NCBTMB. Also, Transformational workshops "Re-Membering Your Spirit", a journey through the chakra system and "Awakening your Heart Chakra". Gloria has been training massage therapist for almost 20 years. Her passion and love emanates in her teachings. She has trained individuals nationally. 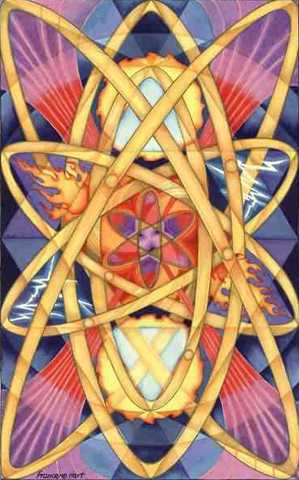 Energetic and physical healing through the Ritual of Massage and Energywork. We will co-create a safe and sacred space for you to journey into your own feeling of health. Energywork, such as Reiki and Chakra Balancing, can be performed totally off the body. LomiLomi, Swedish and Deep tissue work to release muscle tension in different ways. We can be elaborate or very simple within the space of our session. Lara Narayani Golland has 15 years experience in the natural healing field. Studies of Massage, Meditation, Yoga, Ayurveda, Soulpoint, Qi-Gong, Indigenous Dance, Drumming, Chant, Spirituality, Natural Birth Support and Natural Spa Therapy. Through practicing healing arts from various cultures, we tune into the simple laws of nature and realize that all life is holographic and thus connected. 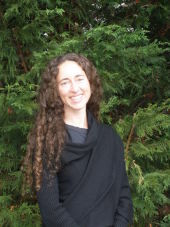 In Santa Cruz, Lara Narayani is now available for compassionate and intuitive Massage Therapy. 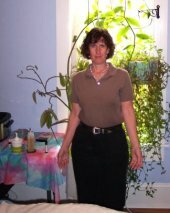 She gives talks and offers energy clearing treatments long distance and around the globe by appointment. Professional Ayurvedic Medical Practice offering Health Consultations, Pancha Karma, Therapeutic Massage, Yoga Therapy, and Workshops. 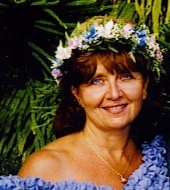 Lynn Harris, Licensed Massage Therapist, Certified Neuromuscular Therapist, and Certified Zero Balancer, has advanced training in Craniosacral therapy, and Hawaiian Lomi Lomi massage. With over 25 years of experience and over 2,000 hours of training, Lynn has integrated these techniques into her own creative style. Besides giving a wonderfully relaxing healing massage, Lynn specializes in more detailed complaints such as neck and low back problems, whiplash, frozen shoulder, sports injuries, TMJ, headaches, scar tissue adhesions, and digestive problems as a result of trigger points. Come early for your session, and enjoy relaxing on the therapeutic massage chair in a tranquil setting. Take with you your peace and relaxation, and new self help techniques to keep you healthy. Lynn's office is conveniently located on Fairview Rd, one mile from Exit 8 off of I-240, and 1 mile from Biltmore Village. Connective Tissue Massage - This type of work is focused on the connective tissue, or fascia of the body. The fascia wraps and binds everything in the body, including the nerves, veins, bones, muscles, and organs. Due to surgery, physical injury, poor body mechanics, and a number of other reasons, our fascia can become tightened, or hardened. CTM works to open, lengthen, and liquify these areas of the body. When applied correctly, CTM helps relieve chronic tension, promotes deep relaxation, enhances self-awareness, improves posture and increases range of motion. People tend to feel lighter, longer, and more open throughout their bodies after a session. Connective Tissue Bodywork - A combination of Structural Integration, a series of 10 sessions intended to help re-organize the bodies segments around a central axis, and Hypnotherapy, creating a safe place and a trusting relationship to allow for emotional release and healing. Supporting language helps encourage clients that are willing to explore parts of themselves that may need attention/healing. I have been a practicing massage therapist for 5 years. I graduated from the North Carolina School of Natural Healing where I received a very thorough and in depth education in the power and subtleties of touch and healing. My massage can be dynamic and firm yet still invoke the inner calm needed for integrated healing. I will often employ various techniques depending on what the body is asking for. This might include Swedish, Deep Tissue, sports massage, passive stretching, Reflexology, Traeger, Myofascial Release, Neuromuscular or simple stillness and holding. I am also experienced in all spa treatments including Hot Stones, exfoliations, and wraps. I believe my motherhood and practice in dance and yoga have deepened my natural ability to listen with sensitivity, feel the energy of the body, and bring balance through nurturing. I like to bring my clients' awareness to the body-mind connection and believe that massage addresses not just the physical aspects of our Selves but the emotional and spiritual as well. For this reason I work to create a safe space that is pleasant and comfortable. I promise to give you my full attention and energy and to work with you to design a session that is what you want and need. Together in this way, we elevate the massage room into a sacred space that allows for the massage to address the whole of You. I also promise to use only organic oils, filtered water, and green cleaning products to do my part to ensure your health and honor the health of our great planet. 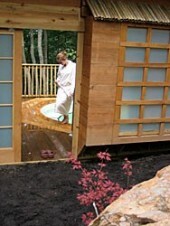 An outdoor Japanese style hot tub retreat, nestled in the heart of the Blue Ridge Mountains, Shoji Spa & Lodge is just 8-10 minutes from downtown Asheville, NC, a favorite vacation area for the sports enthusiasts, nature lovers, and cultural explorers. We are Asheville's one and only hot tub day spa. The perfect romantic getaway in Asheville N.C.
We welcome groups up to 30 people with hourly private hot tub rentals, a cold plunge, and dry cedar sauna. We offer our guests lots of extras including Japanese Yukatas (your robe is worn in all public areas, bathing suit is optional in private tub areas), sandals, towels, herbal soaps, shampoos, lockers, hair dryers, slate showers. Your private tub is enclosed with Shoji sliding doors and bamboo walls on three sides tucked into a mountainside. The fourth side is open to the West with fabulous sunsets, cityscape, night sky views as well as views of the Pisgah National Forest which Shoji borders..
Before you arrive, you may want to read the article written for the New Life Journal describing the Benefits of Soaking.